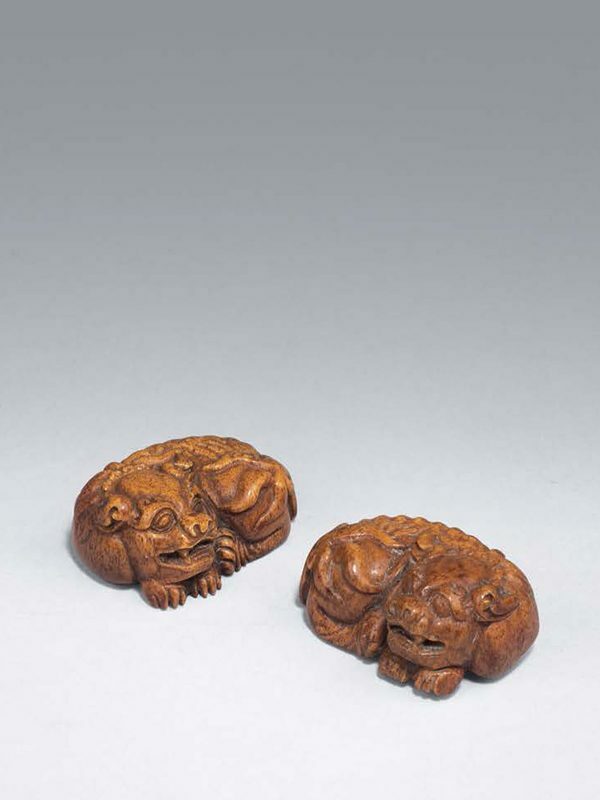 A pair of horn miniature sculptures, each in the form of a recumbent lion. The animals turn their heads toward the side of their body, with ears folded down, the four arched legs tucked under the body and the paws resting flat on the ground. The bulging eyes, strong jaw, and wavy mane are carved in detail. The tail is curled around the hindquarters. The animals are well polished and the material is of amber colour, with some darker patina around. Lions (shi in Chinese) were not indigenous to China, but were sent to the Han court by emissaries from Central Asia and Persia as tribute gifts via the Silk Road as early as 87 CE; they later became known as ‘protectors of Buddhism’ and were associated with royalty. The majestic stone or bronze lions guarding the entrances to official buildings and residences in China are usually depicted in pairs. Miniature carvings fall into the category of objects whose main role is simply as a scholar’s trinket, a precious little item to have around, play with, carry about and, if occasion demands, press into service as a paperweight. Horn carvings, such as the present lions, whose material probably is antler or moose horn, could be used for snuff bottles or scholar’s objects, but are rarely seen in such miniature sculpture form. A comparable example in bronze, a seated Buddhist lion wearing a bell and tassels around its neck, originally used as a paperweight, is dated to the early Qing dynasty and is illustrated in Chinese and Japanese Bronzes, A.D. 1100-1900. Another comparable gilt bronze paperweight of seated lion form, dated earlier to the Ming dynasty, was included in the 1986 exhibition Arts from the Scholar’s Studio. An antler horn brush rest inscribed with an imperial poem of the Qianlong emperor and dated to 1751 is in the collection of the National Palace Museum, Taipei.